This entry was posted in Android and tagged analysis, chess-engine, database, PGN support by Mike D. Bookmark the permalink. I am using HTC Wildfire (Android 2.2). I played against desktop computer running Chessmaster GM edition. ChessGenius had 10 seconds per move, not thinking on opponents time. Chessmaster had 2 minutes, Fischer style, 1sec increment (through the game its time never dropped below one minute) and it (apparently) had thinking on opponents time. The game was a draw! 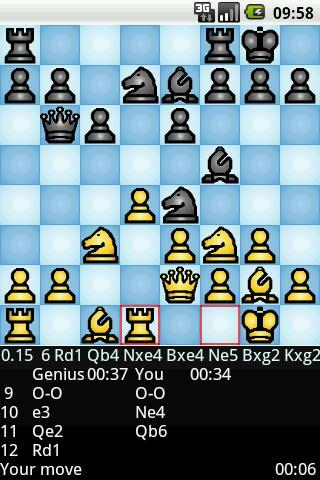 Also, a friend of mine has Genius on Nokia N95 (Symbian) and it BEAT the Chessmaster on desktop PC. Chessmaster’s desktop pc ingame rating was around 2900. So, I would say the ChessGenius on Wildfire and N95, with thinking time above few seconds, has a good GM strength. The tradition of ChessGenius continues I’ve had ChessGenius on numerous platforms and now on Android too. It’s a good chess partner and compared to Shredder I like that it displays the name of the opening. Chess Genius is just gold. It’s been with me through a number of devices and operating systems including Palm, Symbian S60, Windows Mobile 6.5, and when getting my first Android phone this was the first program I looked for. It’s still on my short list of the first things I install on a new device. The PGN support makes this little program incredibly full featured. I can not only play casual games on it, but I can use it for endgame training, and write down games into a database. Speaking of little: Even the most basic apps these days seem to consume at least 50 MB on your phone. This little gem takes about 1 MB! Support is also top notch. This program may be _old_, but it still receives care and love to keep it running flawlessly on whatever new devices comes out. And the support is very responsive if you send a request.